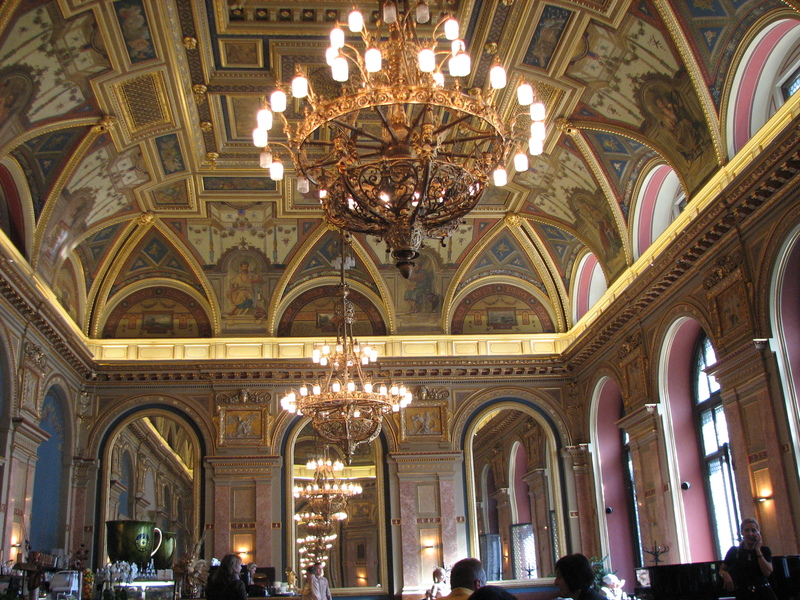 Indulging in the cafe culture in Budapest was a high point of my visit to the Hungarian capital.Budapest has a long coffee tradition that started in the 1600s with the Turkish occupation. Later during the 19th century, when Hungary was experiencing their Golden Age, there were over 400 coffee houses in Budapest alone. These coffee houses catered to writers, poets and artists during this time by providing them with free paper and ink as well as a special discounted menu. 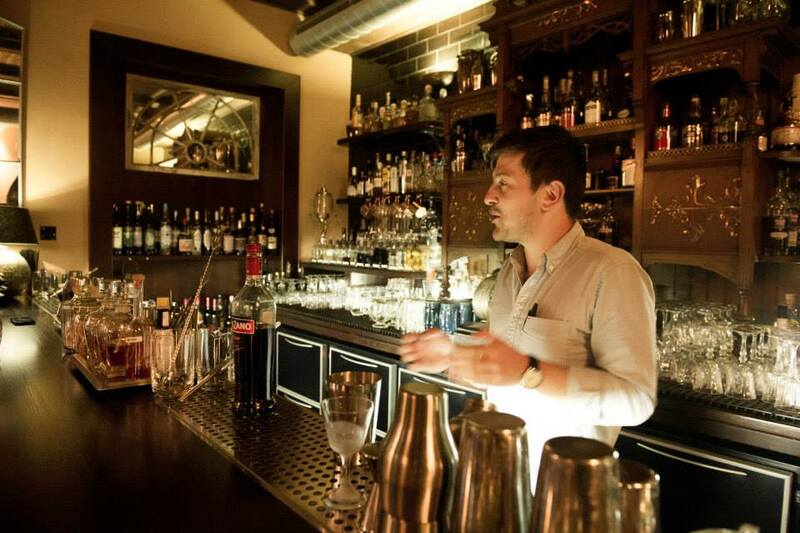 It’s no surprise that these cafe’s became a mainstay for Budapest intellectuals. Unfortunately, the tradition of these grand coffee houses fell to the wayside under the communist rule of the 20th century. But, in recent years they have seen a revival. Many of the large cafe’s from the 19th century have been restored and are now open for business serving coffee to tourists and locals alike. I was lucky enough to visit two of these coffee houses during my trip. The New York Cafe is on the ground floor of the immaculate Boscolo Hotel. Walking in, you’re almost overcome with just how decadent the interior is. I’ve read a few guides where people remark that it’s “just like stepping back in time” and it truly is. The cafe’s interior is incredible with white marble floors and stairways, gold molding, painted frescoes and of course sparkling chandeliers. The tables are all topped with white table cloths and the chairs are plush and red. There isn’t a plain or ordinary spot in the entire place. The cafe was opened in 1894 and was a particular favorite for writers and editors. There is even a legend that Ferenc Molnar, a well-known Hungarian novelist, threw the keys of the New York Cafe into the Danube so that it would be open all day and night. However, once you get past the overwhelming grandness of the New York Cafe, the feeling of stepping back in time quickly fades like a clever illusion. The place was full to the brim with tourists and hotel guests. There were cameras going off at almost every table, despite the fact that there was a large sign at the entrance stating that photography was prohibited. After being seated and having time to digest my surroundings, I realized that there was something a bit off about the cafe. 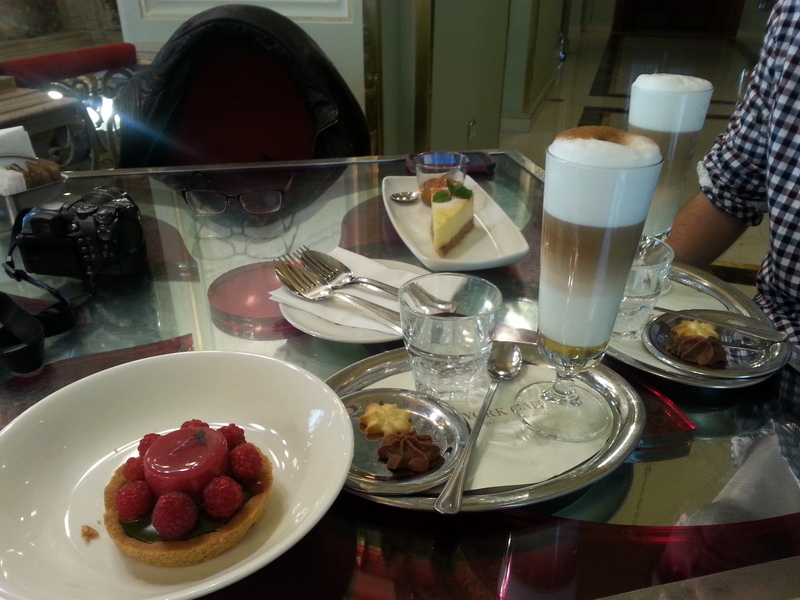 While it was beautiful and the coffee and desserts, while over-priced, were tasty…it didn’t quite feel like a cafe. It seemed like everyone was gawking at the interior or getting up and taking photos in front of it. No one seemed to really be focused on being there for breakfast. It was like being at the Sistine Chapel, only there was the option of coffee. While I had been excited to see the New York Cafe especially after learning about it’s rich history, it was a huge disappointment to see that it’s become more of a tourist attraction than a cafe — an image that it seems to play to. Thankfully, The New York Cafe was not the only restored coffee house that we stopped at. After the New York Cafe, I was determined to find another vintage coffee house in the area. A quick internet search led us to The Book Cafe, which according to the map was less than a five minute walk from the flat we were staying in. Intrigued, we were lead to the Andrassi Ut (one of the main shopping streets in Budapest that ran parallel to our road). There still wasn’t any sign of a coffee house. After looking around the street for a minute, we walked into a book shop that could have been the Hungarian equivalent of a Barnes and Noble. Once inside the book store, we noticed an escalator heading up to another level. We took it to the top floor and lo and behold — the Book Cafe. The fresco ceiling is the first thing I noticed. Numerous figures such as weavers, beer makers, carpenters decorate the top part of the room. Several chandeliers hang down the length of the space. An ornate espresso machine and dessert case sat on the far left of the room. A grand piano stood at the center and tables filled the rest of the area. Ornate glass windows on the far side of the room faced the street our flat was on. The Book Cafe (Lotz Hall) was built in the late 19th century when the building served as a shopping center. Karoly Lotz, painted the frescoes on the ceiling and even included a self portrait as one of the tradesmen. 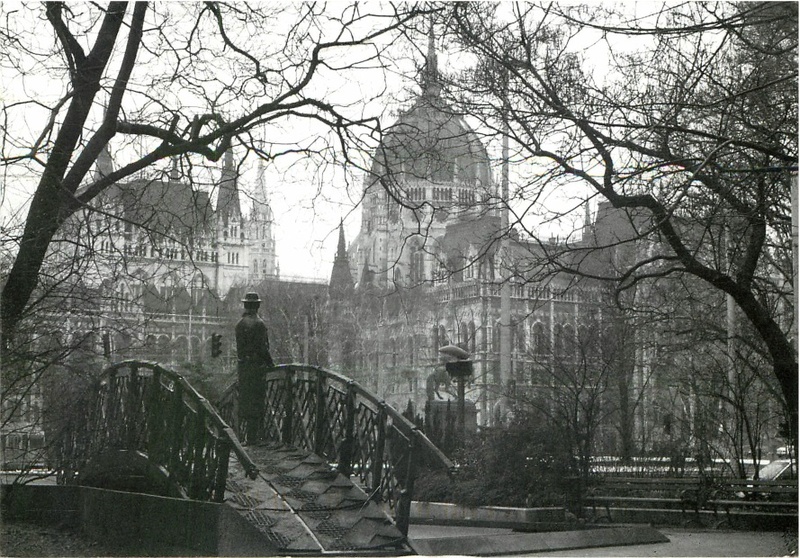 Lotz is famed for also painting murals in Budapest’s nearby Opera House and the Hungarian Parliament Building. The Book Cafe had a smaller but similar coffee menu to that of the New York Cafe. 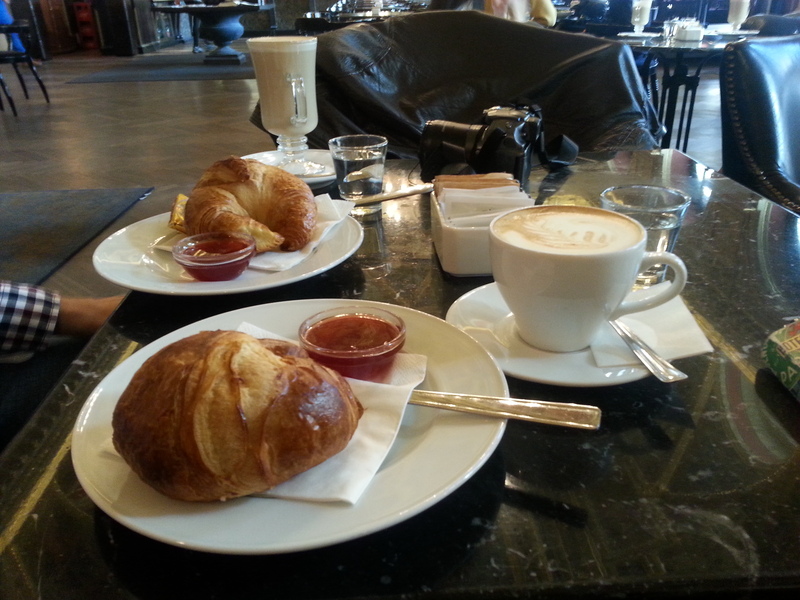 The coffee was good but the croissants were the best I have ever tasted! They were fresh baked and brought to the cafe from a local bakery. The cafe is about the size of a ball room yet it gives off a more intimate atmosphere. While it was busy, it wasn’t crowded or overwhelming. The cafe appeared to be frequented by both locals and tourists. While there were a few pictures taken of the interior, the guests at the cafe seemed content to have a cup of coffee and chat with their friends or read a book. Unlike the New York Cafe, the place still had the nostalgia and spirit of a former time while also having brought itself into the 21st century as a high end venue. Overall, the Book Cafe was a fantastic find. We went back several more times including in the evening for cocktails, cake and live piano music. I received this from the great Andy last week and it has got me counting the days until I leave for my Hungary/Lithuania trip! Only about six weeks to go! 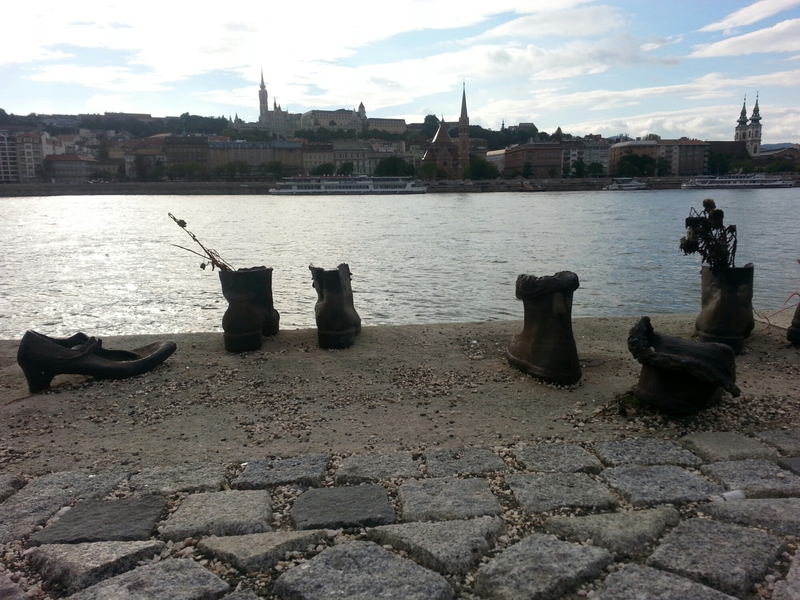 Budapest has been on the top of my list of places to visit since I marked Prague off. 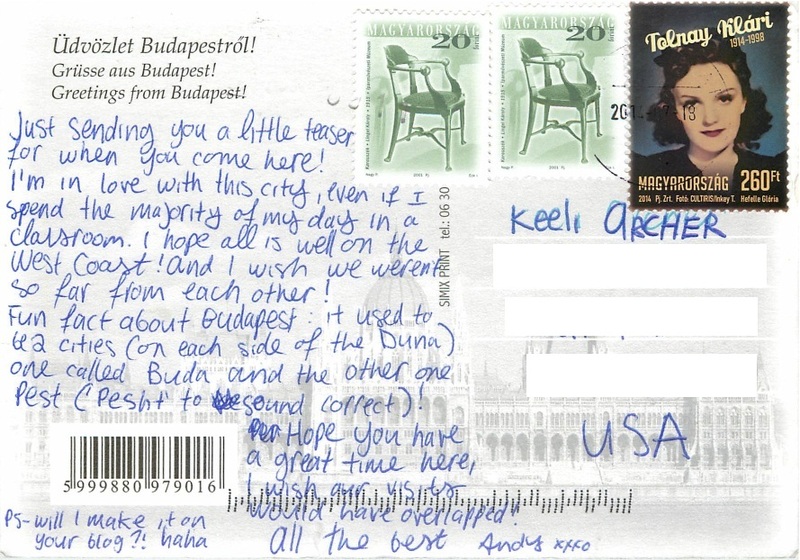 So receiving the postcard from Andy has made me all the more excited. 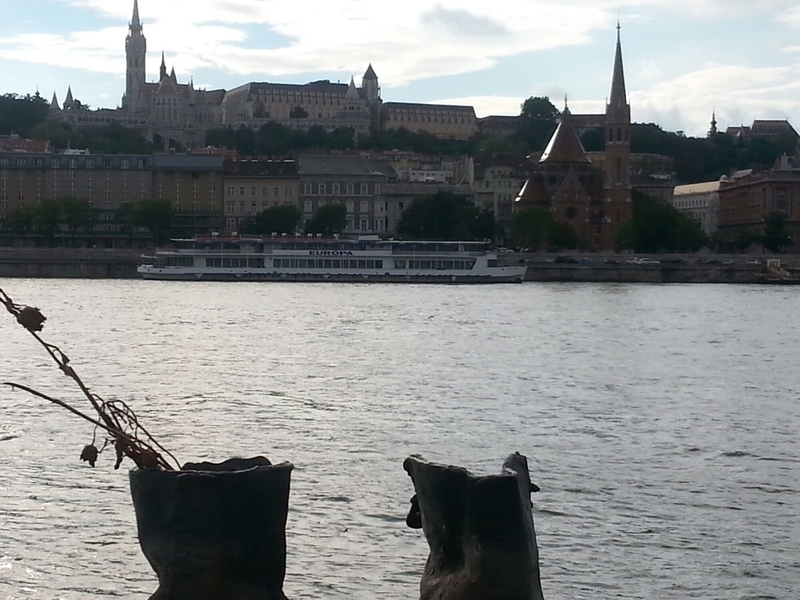 After five days in Hungary, I am then off to Lithuania to see my in-laws. 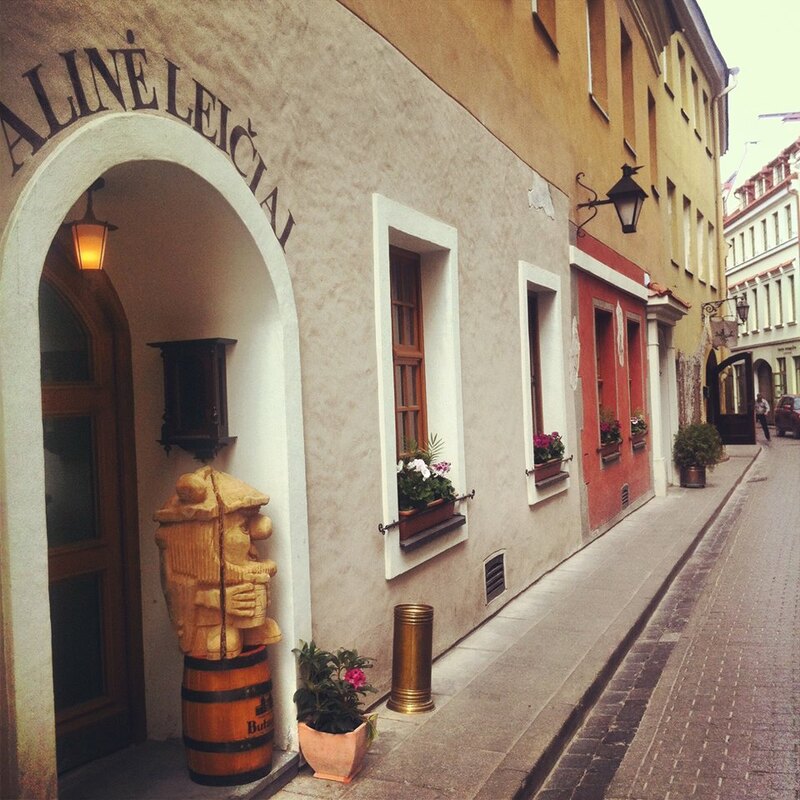 This will be my first trip to Lithuania and I’m excited to go to the Baltics. Additionally, I am going ahead with my plan to bring one bag (a carry on bag) for the whole trip. Let’s see how I manage! If anyone has any recommendations on what to do or see in either Hungary or LIthuania, please comment!